I stand with all Girl Scouts across the country and around the world in offering my thoughts and prayers to all of those who have been affected by the massive and devastating tornado that tore through the Oklahoma City area on Monday. As Oklahoma Governor Mary Fallin said, it was a tragic day for the people of her state and, indeed, for all of us, as the death toll now stands at 24 and includes a Girl Scout, who was a member of the Girl Scouts-Western Oklahoma Council. 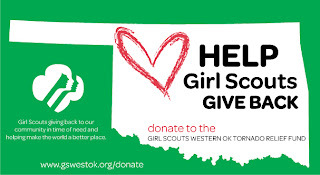 I want to thank everyone for their thoughtful messages of caring and concern for our sisters at the Girl Scouts-Western Oklahoma Council. Even as we grieve for our sister Girl Scout and all those who lost their lives, we are sustained by the resilience of the human spirit and the knowledge that the people of Oklahoma will, in time, recover and rebuild. We have endured in the past year a number of terrible and tragic events, and throughout it all, Girl Scouts have shown remarkable courage, commitment, and leadership. I know that our girls and adult volunteers will do so again in the wake of this tragedy.